ONE OF THE LAST FEW REMAINING COMPANIES THAT USE TRADITIONAL METHODS OF MANUFACTURE INCLUDING STITCHED LETTERS, EMBROIDERED CRESTS, FRENCH SEAMS AND DOUBLE HEMS. USING 280 GRAMME GLM, WOVEN POLYESTER. 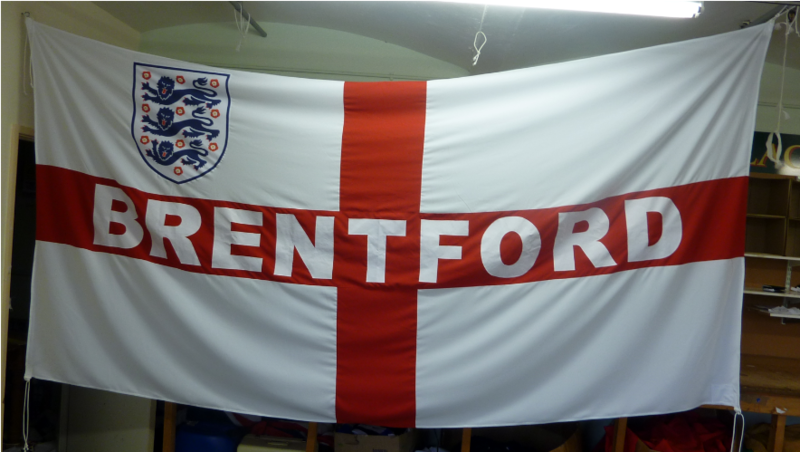 10 foot by 5 foot Saint George Brentford with 3 Lions crest. Copyright Barmy Flags © 2003-2019. All Rights Reserved.